Here’s what I will say about this pie: Martha Stewart failed me this Thanksgiving. I spent a ton of time working on 2 desserts from her November 2011 issue: the 6-layer salted caramel chocolate cake, and this pie. Both sounded delicious in theory, neither really worked. And since I take baking pretty seriously this was not good. We had my in-laws staying with us Thanksgiving week, so hearing baking comments and questions from the MIL every time I brought out a new dessert fail essentially killed my festive spirit (pregnancy hormones didn’t help, either). Nobody needed to tell me they were both insane desserts, but who doesn’t want their houseguests to just lie to them? The holiday overall was wonderful, I’ll post pictures later this week. I still have my sense of humor about the whole thing, but it was so exhausting that it’s taken the entire past week to recuperate and get some energy back. Hence, no blogging for a while. But now I’m in full Christmas mode and have lots of things to post. Anyway, my issue with this pie was the meringue recipe itself. I never got an actual meringue despite following the directions exactly (including leaving the eggs out to get to room temperature). I got more of a droopy Fluffernutter kind of topping that was sickeningly sweet and just collapsed when you tried to cut into it. 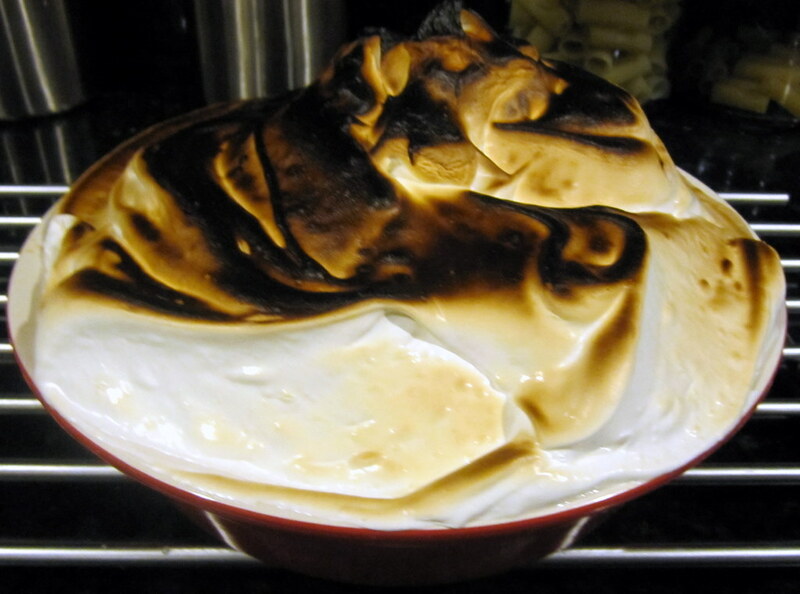 I’m perfectly willing to admit that this might just be a recipe I didn’t grasp, but since I’ve made a killer meringue before with no issues I’m not sure it’s entirely me. By the time I browned the top I knew the pie was a mess and actually forgot it was in the broiler. This is the nicest picture I have of it, and I’m not going to post my step-by-step here since I doubt I’ll ever make this again. But I wanted to document it because I did complete another month of my pie-a-month project this year. Here’s the link to the original recipe.